It is important to be aware of where you are storing your body fat because body shape and health risk are linked. Body fat is generally stored in two distinct ways; either around the middle making the ‘apple’ body shape; or around the hips making the ‘pear’ body shape. The apple shape poses more risks on your health, as fat is released more readily into the blood stream, raising blood pressure and levels of LDL and increasing your risk of lifestyle related diseases, such as heart disease and diabetes. Waist to hip ratio is calculated by dividing your waist measurement by your hip measurement. Ideally, men should have a waist-hip ratio of less than 0.95 and women should have a measurement of less than 0.85. Your BMI is an objective scientific measure that uses your height and weight. You can calculate your BMI by dividing your weight in kilograms by the square of your height in metres. BMI is to be between 20 and 29.9 for both male and female applicants. This test involves continuous running between two lines 20 metres apart in time to recorded beeps. For this reason the test is also often called the ‘beep’ or ‘bleep’ test. The time recorded between recorded beeps decreases each minute (level). The initial running velocity is 8.5 km/hr, which increases by 0.5 km/hr each minute. Female applicants under 30 years must reach a minimum of level 6.6; between 31–39 years must reach a minimum of level 6.2; and 40 years and over must reach a minimum of level 5.7. Male applicants under 30 years must reach a minimum of level 8.8; between 31–39 years must reach a minimum of level 8.4; and 40 years and over must reach a minimum of level 7.8. The push up test measures the muscular endurance of the chest, upper arms, and shoulder muscles that are required in restraining, subduing, separating and defending. Applicants must perform as many push-ups as possible in a 60 second period without pausing. Female applicants are required to complete a minimum of 6 push-ups whilst male applicants are required to complete a minimum of 20 push-ups. The Illinois Agility Test (Getchell, 1979) is a commonly used test of agility in sports. The test will be conducted on a wooden gymnasium floor. 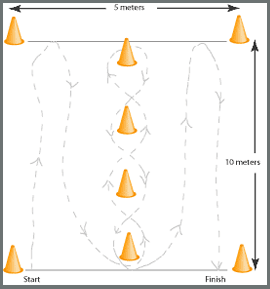 The course is marked out with cones and/or poles and your time to complete the course recorded as your score. The diagram above illustrates the course set up for the Illinois Agility Test. Female applicants are expected to complete the test in < 22.0 seconds and male applicants in < 20.0 seconds. The Grip Strength Test is designed to measure the combined gripping strength of the hands that is needed to fire weapons, apply restraints, and control or subdue violent offenders. Grip strength also has a moderately high correlation with the total strength of 22 other muscles of the body. Thus, measurement of hand grip strength gives an indication of the overall strength of an individual. Female applicants must obtain a minimum score of 25 for each hand on the hand grip strength dynamometer. Male applicants must obtain a minimum score of 45 for each hand. 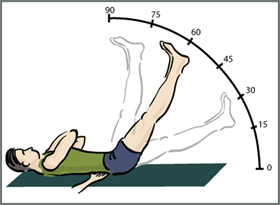 The purpose of this test is to estimate the degree of abdominal strength. Poor abdominal muscle strength can cause poor posture leading to lower back pain. off is the measurement of their abdominal strength. Your abdominal strength must measure 45 degrees or below for both male and female applicants.